The late René Girard - he passed away earlier this month - was one of the most original thinkers of the past one hundred years. I believe his work will eventually prove more important than the works of Freud, Nietzsche or Marx combined. And not just because he was right and they were wrong. Girard's groundbreaking insight - that humans are 'mimetic', i.e. : that our desires come from observing what others want, with the result that human culture ultimately degenerates into violent competition for the things desired until a sacrificial scapegoat is found to 'take the blame' and so peace is restored (for a while) - has profound implications for our understanding of modern humanity and the worsening problem of collective violence. But he went further: he argued that Christianity represented a 'structural break' in human history because, for the first time, the scapegoat - Jesus Christ - was innocent, and seen to be such. Now to our 21st century ears this might sound obvious: but Girard points out that every other culture (and many since) have always assumed the 'guilt' of the scapegoat. Indeed, he saw most religions as a solution to the problem of mimetic violence as they were built around a cult(ure) of sacrifice to preserve the peace. Christianity 'revealed' the falsity of the scapegoat mechanism, throwing us back on a previously unknown solution to humanity's mimetic compulsion to escalating violence: turning the other cheek and desiring the one thing everyone can have without constraint on the other, i.e. : the love of God. It worked, at least for a while. The power of any theory - be it psychoanalysis, dialectical materialism or mimetic theory - is found in its predictive power. On this basis, Girard's theory stands head and shoulders above what passes for most contemporary analysis of our global situation. He sees the violence of Islamic Jihadism as a regression to a type of mimetic rivalry that threatens to drag us back to pre-Christian ways of competition and conflict. Nor is the post-Christian West immune from mimetic rivalry and escalating violence. Girard saw the rejection of the West's Christian heritage (in a desperate attempt to stand outside of history, culture and heritage so as not to be ethnocentric) as a precursor to a greater level of collective violence than even our pre-Christian ancestors could have imagined. Nothing short of apocalypse in an age of Total War. As more and more Western powers queue up to bomb Syria and rid the world of The Taliban al-Qaeda ISIS, we once again we find ourselves trapped in a world of mimetic desire and the search for scapegoats. It won't end well. It never did, and it never will. 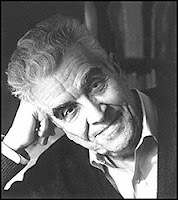 By the way, you can download and listen to a marvellous, five-part interview with René Girard by David Cayley - called The Scapegoat: René Girard's Anthropology of Violence and Religion - on iTunes here.